Watch out! Before you try to handle the problem yourself remember many species of squirrel are protected by law. Don't take the problem into your own hands. Our humane trained specialists will effectively eliminate your squirrel problem. Aha, no more squirrels in the attic. Seeing chewed wires? Call us at (510) 900-8593 before you start to have serious electrical problems. Exposed live wires that can be chewed by burrowing squirrels can present a serious risk of fire and electrocution as well as an interruption of power in your home. As soon as we get to your property your house will be given a thorough walk-around to determine any entry points the critters used to get in. At that point all entry points will be sealed and squirrel traps will be laid out. Killing squirrels is never the ideal situation as it is more ethical and just as effective to simply trap them and relocate them to a safe location. We are the critter removal specialists after all. Squirrels aren't just tree climbers and nut eaters. In fact, they can cause tons of damage to people's properties once they decide to take refuge there. During their time trying to create a nest, they will chew through nearly all types of materials in an effort to get to their nest. Their strong powerful teeth allow them to bite wood, electric wiring, and cause other damage all over. Not only that, but they will bring in foliage and dirty up your property with their feces and urine that will bring in more types of critters that you will have to face. We handle squirrels through an effective trapping plan. We use techniques to create steel meshing traps that will keep squirrels off of the property, and provide a door that only will go one way so that once they leave, they can't come back. Squirrels are a very common animal here in the bay area where there are tons of trees and beautiful landscapes where the squirrels try to create nests and find solitude in the safe environments that humans have. But once squirrels are taking shelter, the environment is no longer safe, especially if you have other animals or small children that the squirrels could possibly be a threat to. 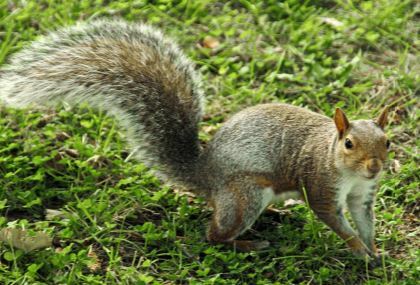 There are always reports of squirrels contracting various diseases, particularly rabies, and then attacking animals or humans that intrude on their nests. Common areas that squirrels will try to hide in, and things that we get frequent calls for are squirrels in the attic, in walls, or setting up nests in people's yards, particularly those that provide a food source. Squirrels are commonly found nesting throughout woodland areas. As human residency has increasingly pushed into these natural ecosystems, squirrels are frequently seen taking shelter in attics and garages to make their nests in the warmth. They like to chew through the wall and stay there for the winter. and any exterior holes that you do not recognize. Another sign you may need professional squirrel removal would be small holes in the yard or the presence of droppings. Note: Do not venture to remove or identify the droppings yourself. Our experts will be able to handle the dirty work and assess the situation with ease. ​Rest Assured (or not assured in this case) once you have squirrels present in your home you will have no rest until they are removed. Squirrel activity is quite noisy and will certainly prevent you from having a calm sleep. You may hear squirrels fighting which is also a sign that the population is too big to not be a huge problem. Squirrels are a tricky animal to remove due to their larger brain capabilities than more common pests, and their quickness and agility.